The "Essence", one of two 28', 3-layer plywood, Ray Hunt designed "minimum yachts" built in Kennebunkport, ME in the late '50s or early '60s. Hull design is said to have inspired Richard Bertram's 'deep-vee' hulls. She has been severely neglected and may require extensive (read expensive) restoration. 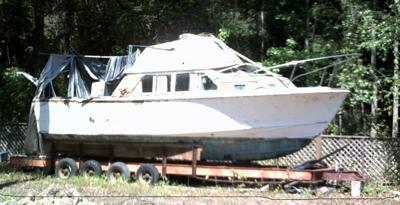 Currently sitting on her own trailer (needs tires), uncovered. Two previously-installed Volvo-Penta 6-cyl. gas engines available separately. Located in my backyard, buyer responsible for all moving costs. What do you want for this boat?